The Down-fi electronic press kit and band bio on Cavetone Records. 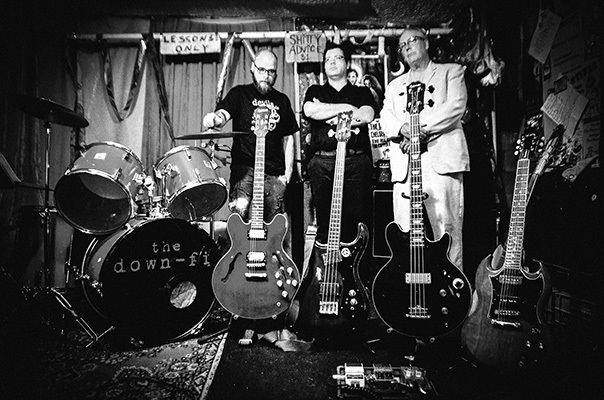 The Down-fi mashes out a sonorous, explosive, and intriguing form of garage-y rock and roll. The power trio from Indianapolis, IN harnesses the ethos of the 1970s proto-punk movement, where Craig Willis Bell provided bottom end and song composition for Rocket From the Tombs. The Down-fi is punk before standardization and rock and roll after adolescence. This is the story so far. To truly understand The Down-fi's place in the American music landscape is to trace the history of one Craig W. Bell, who showcases a lifetime of songwriting in each Down-fi performance and recording. In addition to his tenure in Rocket From the Tombs, throughout the 1970s and 80s Bell provided a driving force in future-revered groups Saucers (Connecticut) and Mirrors (Cleveland). His bands garnered the attention of punk oracles such as Lester Bangs and Legs McNeil as well as spawning the Dead Boys, Pere Ubu, Dumptruck, and Miracle Legion among others. This is the story so far. The story picks up in 2008 in the punk rock rust belt of Indianapolis, IN where Bell put together The Down-fi by cherry picking some of the best players in the Indy scene. Joined by Samuel “Dr. Doomtone” Murphy (The Dockers) on guitar/shouting and Blane Slaven (Three Cent Queen) on drums, the trio has multiple releases on the Gustav label and has racked up milage touring around the Midwest. In 2014, Bell, Murphy, and Slaven recorded a seven inch record so impactful, that it was the first double A-side released in Cavetone Records history. As usual, the release best explains the band. The first A-side “Roadmaster” is the psychedelic punk that provides the soundtrack to an exploitation motorcycle movie. The songs veers wildly as the fuzzed-out guitar winds, the engine of the drums and bass pound, and vocals scrape across every inch of asphalt in the vein of Steppenwolf meeting most of the New York Dolls. The second A-side features “Why Me,” a two-minute powerpop song with snarling desperation reminiscent of a ramped-up Kinks live track mating with a meaner Cheap Trick. But that's the story so far.